Natural cockle shell, fully cleaned and partially crushed. 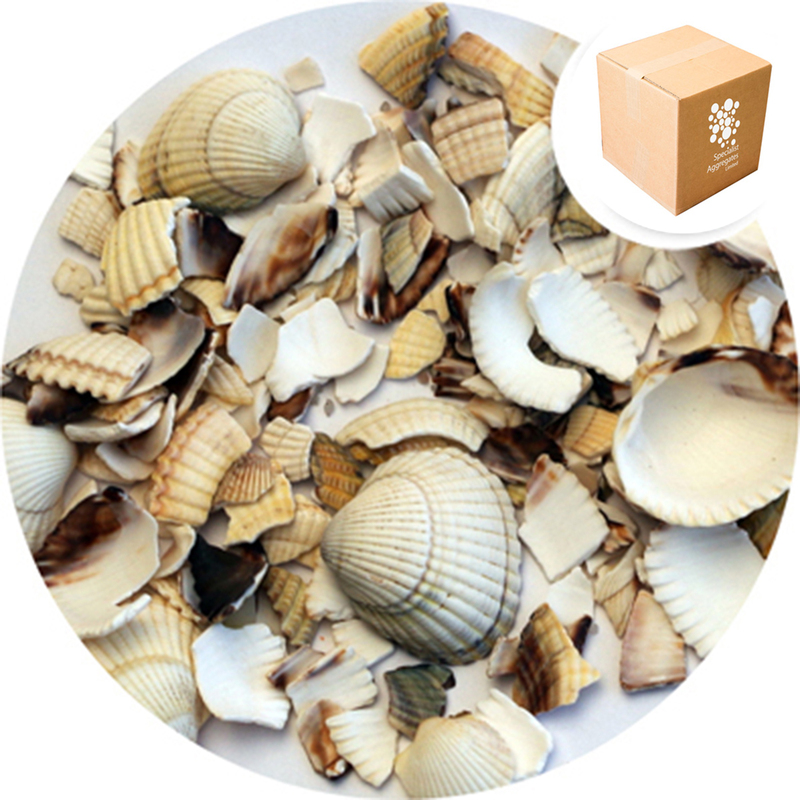 This product is our cleanest and whitest shell material available for pebble dashing and is offered as a replacement for Barra Shell Harling. Coverage: Coverage will depend on the skill of the applicator, the density of cover required and wastage during application. As a guide application rates in the order of of 3kg per sqm may be expected. ie a 12kg pack could be expected to cover approximately 4sqm. 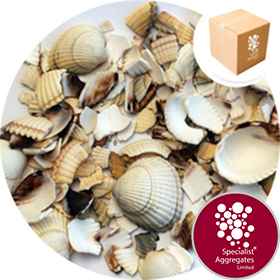 UK Sourced natural cleaned, crushed and whole cockle shell offered as a replacement for Barra Shell Harling. This product represents our cleanest and whitest shell material available for the repair and creation of renders cast with Barra Shell. Depending on the specific application some of the larger whole pieces of cockle may require to be broken down using a lump hammer or similar prior to application. 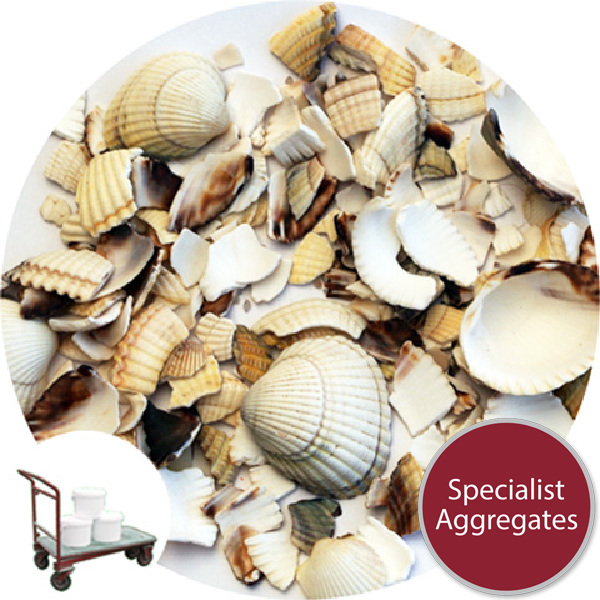 For a smaller fully crushed material see our listing for Barra Shell Harling Repair Crush (Product code 8960CR). The original weather bleached white Barra Shell was collected from the island of the same name in the Outer Hebrides. The shell beaches on the Isle of Barra are part of a complex series of raised beaches found on the Highland and Island coasts of West Scotland. The most recent beaches were formed around 12,000 years ago when the melting of ice sheets in Northern Europe caused a rapid increase in sea level which pushed the beaches inland. However, the removal of the mass of ice also caused the land to slowly rise (a process known to geologists as isostacy) leaving these ancient beaches as we see them today, quite literally high and dry. Based traditionally on lime, but more recently cement mortars have been used to provide a provide a base course. 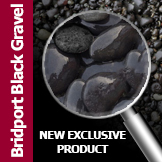 Stone chippings, pebbles, crushed and whole shells are then broadcast onto the surface and lightly pressed in to provide a durable and decorative finish. 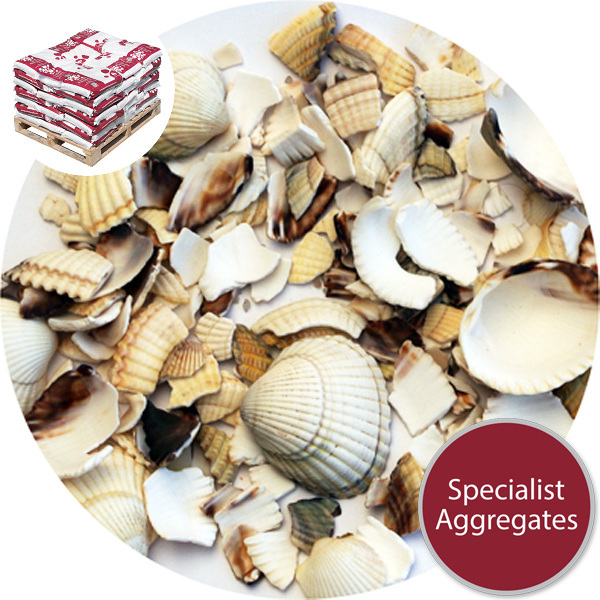 Specify: Barra shell harling repair from Specialist Aggregates.